Our range of products include horizontal laminar air flow. Laminar air flows can maintain a working area devoid of contaminants. Many medical and research laboratories require sterile working environments in order to carry out specialised work. Laminar Flow Cabinets can provide the solution. Why Laminar Flow Cabinets? Laminar Flow Cabinets create particle-free working environments by projecting air through a filtration system and exhausting it across a work surface in a laminar or uni-directional air stream. They provide an excellent clean air environment for a number of laboratory requirements. 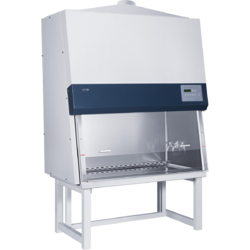 Laminar Flow Cabinets are suitable for a variety of applications and especially where an individual clean air environment is required for smaller items, e.g. particle sensitive electronic devices. In the laboratory, Laminar Flow Cabinets are commonly used for specialised work. Laminar Flow Cabinets can be tailor made to the specific requirements of the laboratory and are also ideal for general lab work, especially in the medical, pharmaceutical, electronic and industrial sectors. Looking for Clean Air System ?